Make your way to a centrally-located trolley stop, where you can climb aboard for a tour of the historic city. The guide will help bring 270 years of Savannah history to life, following a carefully-chosen route through Savannah’s National Historic Landmark District, one of the largest in the United States. You’ll see some of the city’s elegant pre-war mansions, and ride along cobblestone streets in the shade of moss-draped oak trees. Take in some of Savannah’s most beautiful squares, then head to the Savannah River for views along the water. 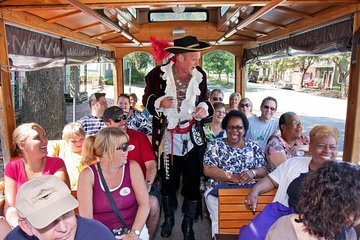 Throughout the tour, the guide will share scenes from life in the historic South, and set a fun, easy-going pace that’s the perfect way to experience Savannah. This 1.5-hour trolley tour concludes at the original departure point. Very good overview of the area. You are able to hop on and off of this tour, which made it very enjoyable. We hopped off at the market district to get lunch and then hopped back on later. Our two guides were good and very knowledgeable. The characters who joined the trolley at different stops were very entertaining. Staff very polite and courteous. Explained the process and directed us to location of bus. The driver- leader most informative; she explained the history of the sights most carefully. We could ask questions as desired. The route was good for the first time visitor. We could relate the streets and places for us to visit afterwards. Our guide Ben was a hoot!!! Both knowledgeable and his humorous is the best.Really enjoyed our family's tour around Savannah. Very Informative and relaxing just riding around. I would recommend buying the On/Off Tour which I didn't do and wish I had of..this way you will get the best out of the tour...saving you time and money in the long run! Tour guide was very knowledgeable and history of Savannah was very interesting. We really enjoyed our Trolley tour. Our tour guide was fantastic. We really liked the costumed historical figures that boarded the trolley during the tour and gave us some interesting stories. We would highly recommend this tour to everyone. Great tour which provided thorough insight into the history of Savannah.